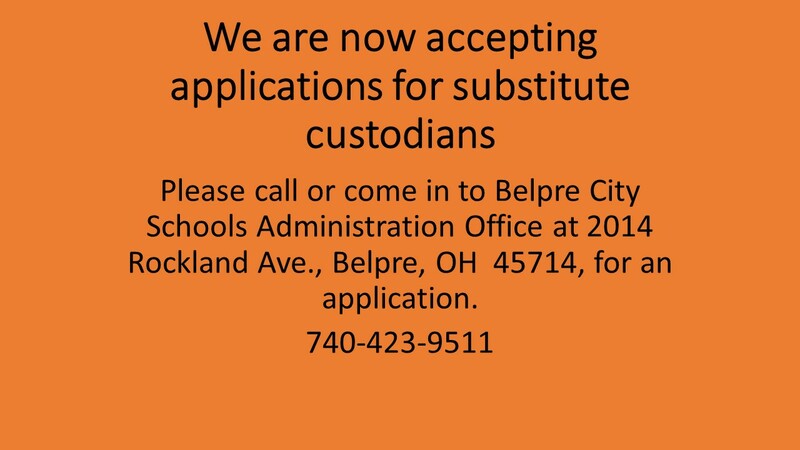 Interested candidates and qualified applicants should contact Mr. Jeffrey Greenley, Superintendent, Belpre City Schools, 2014 Rockland Ave., Belpre, OH, 45714, in writing. Applicants should also provide: a completed Belpre City School application for employment, current resume with references, copy of Ohio license, copy of credentials and transcripts, and a copy of current BCI and FBI background checks. 1) Download and complete a Classified Application from the bottom of this page OR pick up an application from the district office located at 2014 Rockland Ave., Belpre, OH. 2) Submit completed applications to the district office. 3) After being selected for an interview, a background check will be required. Cost for a background check to and for the applicant is $60.00 cash. 4) After a successful interview and background check, the applicant's name will be submitted to the board of education for approval. "An equal provider of services and an equal opportunity employer"
Prior to entering the classroom as a substitute teacher, please take this training classs. Click on the link below to begin the course. All license applications (new or renewal) must be completed online with ODE. You will be guided through ODE to create a SAFE account and then the online application. No paper applications will be accepted. ODE no longer sends a paper license/permit to educators or school districts. You may download, save and print it from the MyCredentials section of My Educator Profile. All license/permits expire on June 30th of the expiration year. Remember it is your responsibility to keep your license up to date by renewing if necessary. You must submit a copy of your license/permit for the current year to the district for your personnel file.